At WDG, we are all about open source technologies. With their real-time improvements, customization, and support from huge developer communities, open source is the way to go. But what about open source design? On principle, open source gives developers the freedom to use, modify, and distribute software without the burden of licensing fees. The same principles can be applied to design. 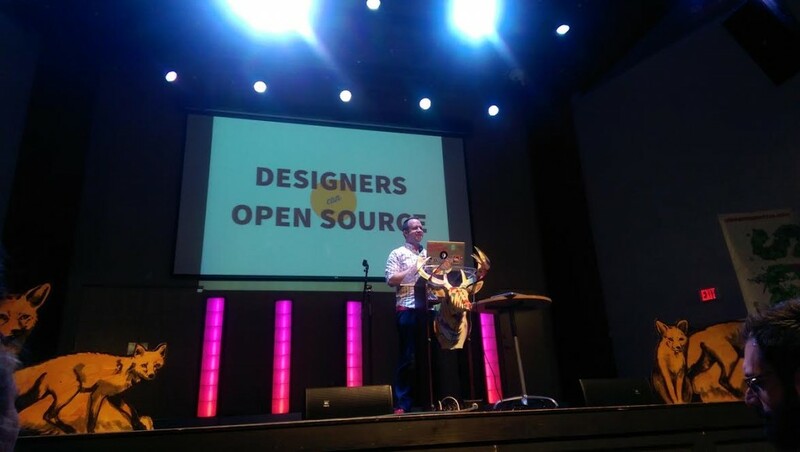 Last week at Converge RVA, Garth Braithwaite made a compelling case about the role of open source practices in design. And at the crux of it, open source encourages enjoyment-based motivation, where design is done for passion, not profit. Now, let’s see what our designers, Kristina and Randall, thought of this talk. Randall and Kristina, hard at work. So, we all went to Converge RVA last Friday. How did you like it? Kristina: It was a lot of fun. I enjoyed hearing what other designers were up to. Randall: It was a lot more fun than last year. Conferences geared at web professionals are tricky–when phrases like “angular.js” are thrown, designers in the crowd (or at least me) feel out of place. This year was nice: the talks were much more open. They weren’t only about design, and were general enough to be worthwhile, whatever your profession is. There were many awesome speakers, including Garth Braithwaite. His talk was about encouraging designers to use open source practices. Agree or disagree? K: Is there an in-between option? I think open sourcing is an interesting idea. Yes, it would be nice if more things were free and open to the public. But as an artist I think it shouldn’t be frowned upon for me to be compensated for my work. I realize that this is probably an overused analogy, but you wouldn’t ask a surgeon to perform a surgery on you for free. So why would you expect an artist to do the same? R: YEEEEE. Open sourcing design isn’t an activity I had ever considered possible. To me, it sounds like to open sourcing a book or a painting, which are things that are quite personal and difficult to make successful when anyone can touch it. I’ve always seen open source projects like Wikipedia as different because their function is based on fact, not something that is more subjective. I do agree with his core thought that open source projects are a good thing, and can produce results that may not have been achievable alone. But I definitely think very skilled people need to direct the project to make sure that quality assets make their way into the final product. My favorite part of his talk was about designer collaboration. To me, it seems work between designers isn’t as strong as, say, collaboration between WordPress/Drupal communities. Do you think this is the case? K: There’s a lot of ego in the design community, and for a good reason. 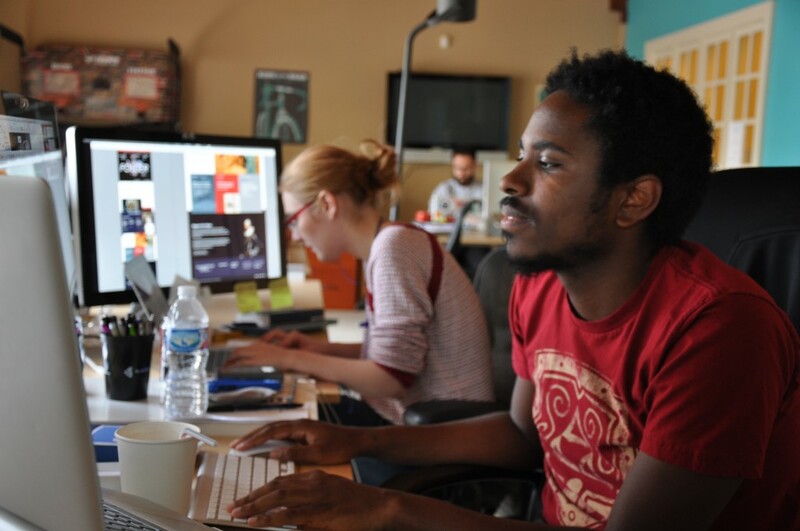 Designers need to be able to sell themselves to their clients, and clients want the best. It can be hard to stop looking at your fellow designers as your competition (especially if clients are always pitting designers against each other over winning a project), and instead work with them. R: I wouldn’t necessarily say that designers have weaker collaboration than developers. The collaboration just functions in a different way, given the objective qualities of code versus the oftentimes subjective nature of design. How do you think online tools (i.e. Dribbble, etc.) could be leveraged to encourage collaboration? K: I think Dribbble already has started. Dribbble is a great place to find other designers and see what they’re working on, comment, and connect. I’m not really sure as far as furthering connections. Maybe I’m coming from an old school of thought, but I think if you really want to collaborate with someone you should just go ahead and do it. Don’t wait for some site or software to help you get started. R: Sites like Dribbble have lost their way in highlighting works-in-progress. What tends to happen is designers use these sites as portfolio sites–a place to show very polished or already-released work. When you’re on a site where polished diamonds are next to initial etchings of what may become a fantastic project, the latter quickly becomes uninteresting in context. While it’s still possible to get critique on your work, I’ve generally found that comments rarely aim to push people forward. Instead, designers seeking critique should look to those immediately around them–both designers and non-designers alike. Garth mentioned the concern about designing for free was heavily outweighed by the benefits of using open source practices. What do you think about this? R: I think it’s completely sound logic. Everything you build, no matter how good or bad, gives you insight on how to tackle future design problems. Every designer doesn’t have to work for free if they don’t like, but nobody should actively discourage voluntary open source work on a principle as shallow as money. Do it for the experience! At the root of his talk, Garth was trying to establish that designers design for passion, not profit, which is why open source should be a feasible thing. As our final question, what would you say to this? K: I think designers should do what they are comfortable with. In a magical world, designers would be able to do whatever they wanted without worrying about being paid, but that’s not this world and most designers know it. If anything, designers should design for profit first and foremost. The passion should be worked in wherever and whenever it can. R: No one’s ever chosen to be a designer because they thought it would be particularly lucrative. I’d hope that designers would put more weight on their love of the profession than their love of pocket change. If there’s multiple levels of commitment designers can offer to an open source project, I’d gladly recommend it to other designers.